Here is a clay project Grade 5 completed in time to be wrapped and placed under the Christmas tree. 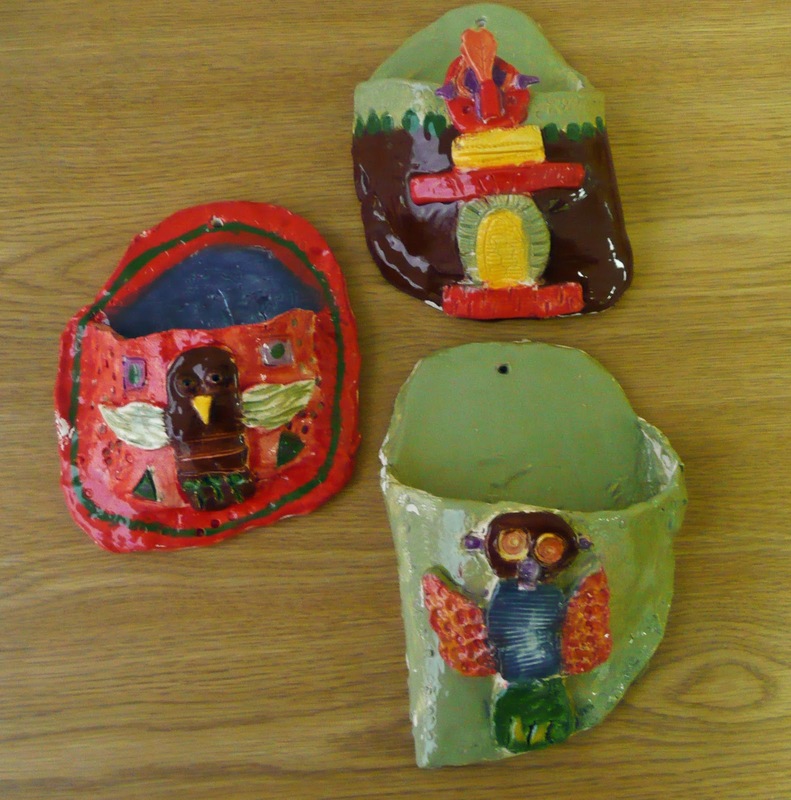 The kids decided on a theme of Totem Poles in keeping with their First Nations Social Studies unit. I brought in a lot of reference material for the kids to look through before starting on their projects. 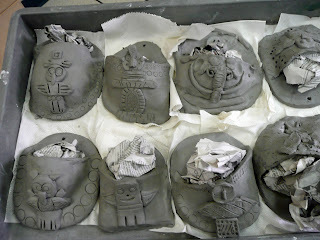 We discussed basic forms and shapes and what they might want to add to their Totem Poles to personalize them. Roll out a slab of clay to approximately 1/2 an inch thick. As you can see I have the kids work on pieces of fabric or canvas. This stops the clay from sticking to their desks. Fabric placemats also work great. From the slab you want to cut a shape like this, I told the kids it's kinda like a shoe or sneaker shape, we used penny nails to cut our shape with but you can also use a wooden skewer or plastic knife. Score the edge all around except the top of the longer edge, rub with some water. Fold over and smoosh the edge together. Add some crunched up newspaper into the pocket to help hold the shape while drying. Make sure you can easily remove the newspaper without disturbing the pocket. Trim off any excess and make sure to add a hole at the top for hanging. 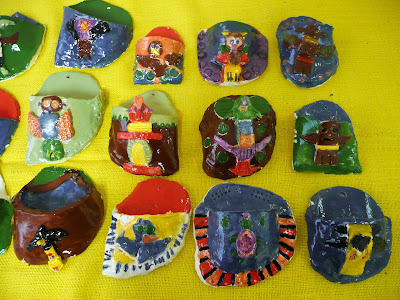 You can use a nail, wooden skewer, or a plastic knife to help cut the clay. With scraps of clay cut out shapes and add to the front to form your totem pole. Make sure to score and rub water on the two surfaces you want to stick together. When finished set the clay aside to dry out undisturbed for about 2 weeks. Remove newspaper and bisque fire at cone 04 in the kiln. Glaze with at least 3 coats. We used Mayco Stroke and Coat which I finally got to work for me....in past projects I had been adding a clear topcoat to the projects which caused hardly any pigment to show...this time I only added the clear to any unglazed areas and it turned out perfectly. 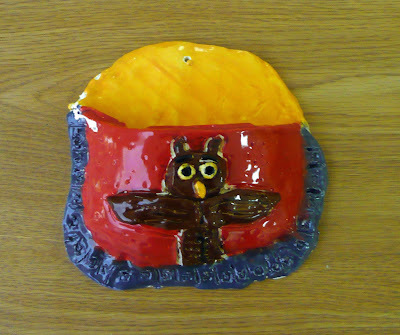 After your glazes have dried cone fire 06 in the kiln and enjoy. So cute! I make something similar with my 2nd or 3rd graders - we call them "posy pockets". The only difference is that I only have air-dry clay, so we have to be very careful. We do not stuff them w/newspaper, but just put two fingers inside the pocket while forming them to shape the opening. I usually make them in the springtime, maybe for Mother's Day. Gail, I use Mayco Stroke and coats, but we fire to cone 04 for bisque, and cone 06 for glaze. It's a technical thing, but worth a mention, as lowfire clay will melt into a puddle at Cone 4, and Cone 6. These projects look great! Thanks Charlene for catching that for me, I changed the post accordingly. Very cute. 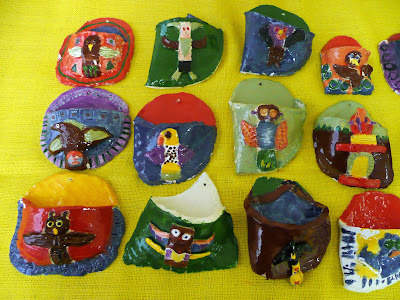 Did you know that you can also paint on wet clay with stroke and coats? Have them put on 3 layers (leave some exposed clay - the back or bottom - for outgassing). You can even skip the bisque firing and fire the whole project at 06.